Berlin, August 21, 2013 – John Deere’s latest XUV heavy-duty crossover utility vehicle line-up features two new models, the fast and powerful XUV 825i Gator plus the four-seater XUV 855D S4 Gator. Drivers who demand advanced off-road performance, all-day riding comfort and the ability to challenge extreme terrain, take note – John Deere has introduced the powerful XUV 825i Gator. This new model has been engineered to be faster, more powerful and more agile than the current line-up of John Deere Gator utility vehicles. Gators have always been known for their durability, versatility and safety. The XUV 825i maintains all of these core qualities, but the extra power and speed are what set it apart in the range. The new XUV 825i is equipped with an 812cc, three-cylinder, liquid cooled, dual overhead cam petrol engine producing 37kW (50hp) and a top speed of 70km/h (44mph), plus a 26.7 litre fuel tank. The automotive grade engine uses electronic fuel injection for easy starting, which together with the new CVT air intake results in smoother automotive-style performance. A fully locking four-wheel drive system allows the Gator to cope easily with all types of terrain. The fully independent, double wishbone suspension system provides 203mm (8in) of wheel travel and up to 267mm (11in) of ground clearance. Power steering with an anti-kickback feature is standard on this new model, providing easy control of the vehicle with little effort, regardless of the driving conditions. The cargo box is made of a 15 per cent glass-filled polypropylene composite material that eliminates rust and dents and reduces noise. The large, one-piece design has a capacity of 454kg. 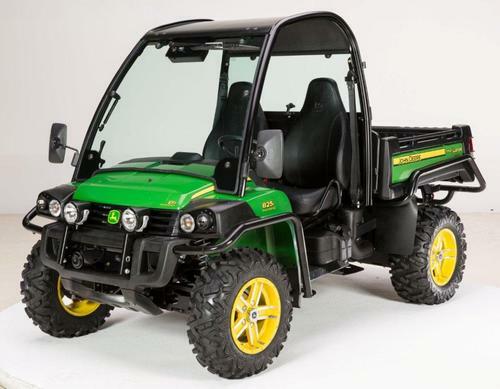 The new John Deere XUV 825i Gator is available in the company’s traditional green and yellow livery. Outdoor enthusiasts sharing the trail or work site can now transport friends, family and gear in the new, heavy-duty XUV 855D S4 Gator. This latest addition to the Gator family provides the durability and versatility owners expect for travelling around their property or to any off-road destination. The XUV 855D S4 is powered by the proven 16.1kW (21.9hp) liquid cooled three-cylinder diesel engine featured in the current XUV 855D model. This Gator also has a top speed of 51km/h (32mph) and comes with power steering as standard. To allow for extra passengers or cargo space, the XUV 855D S4 provides a convertible rear bench that folds down to provide a flat surface for extra storage. A spacious under seat storage compartment is also included. The durable composite and metal hybrid cargo box carries on the Gator tradition of superior hauling capacity on the four-seater models. The introduction of the XUV 855D S4 Gator is a reflection of the growing popularity of crossover utility vehicles. The heavy-duty XUV with its multi-passenger design is comfortable and customisable, and this new Gator provides customers with a good balance of performance and work capability for all off-road challenges. The new John Deere XUV 855D S4 Gator is available in olive and black livery, and like the new heavy-duty XUV 825i it will be available in autumn 2013, together with a variety of factory and dealer installed attachments.